Julie Bruck is a Canadian writer, living in San Francisco. 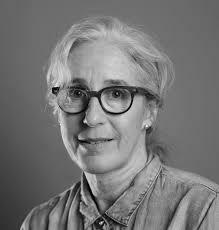 She is the author of four collections of poems from Brick Books: How to Avoid Huge Ships (2018), Monkey Ranch (2012), The End of Travel (1999), and The Woman Downstairs (1993). La Singerie (2013), William S. Messier’s French translation of Monkey Ranch, is available from Les Editions Triptyque. Her writing also appears in magazines and journals like The New Yorker, The Academy of American Poets’ Poem-A-Day, Plume, Poetry Daily, Ms, Ploughshares, The Walrus, The Malahat Review, Valparaiso Poetry Review, Maisonneuve, Literary Mama, Numero Cinq, and others. Her poems have been widely anthologized, most recently in the last four volumes of The Best Canadian Poetry in English, as well as in recent and forthcoming Plume Poetry anthologies. Selected awards and fellowships include, Canada’s 2012 Governor General’s Literary Award for Poetry, The A.M. Klein Award for Poetry, Pushcart Prize nominations, Gold Canadian National Magazine Awards (twice), a Sustainable Arts Foundation Promise Award, as well as grants from The Canada Council for the Arts, and a Catherine Boettcher Fellowship from The MacDowell Colony. Montreal-born and raised, Julie has taught at colleges and universities in Canada, and has been a resident faculty member at The Robert Frost Place in Franconia, New Hampshire. Since 2004, she has taught poetry workshops for The Writing Salon in San Francisco, as well as ongoing private workshops, and works individually with poets on both groups of poems and larger manuscripts. She also tutors students at The University of San Francisco. In 2016, she taught at Pixar Animation Studios in Emeryville, CA. Julie lives in San Francisco’s foggy Inner Sunset district with her husband, writer Lewis Buzbee, and once in a while, their daughter Madeleine.